There are ‘body’ people and ‘mind’ people; ‘flesh’ places and ‘spirit’ places – and to choose one is to forgo the other. This is what philosophers call ‘dualism’, and it can rob exercise of its lasting appeal. Meet Chad. 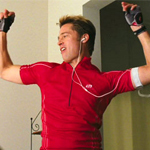 Chad is a personal trainer, from the Coen brothers’ film Burn After Reading. He is a fictional character, but we recognize him immediately: muscular, handsome, full of energy and positive thinking – and as dumb as a sack of small stones. In this, Chad is a symbol of much that is missing in exercise today. His caricature, the idiot athlete, is such a common part of popular culture we can forget its meaning. It is not about this footballer or that tennis player, not a bias about buffed celebrities. It is not really about Chad and other personal trainers. It is a basic prejudice about human nature. The Chad stereotype comes from a conflict: between the mind and the body, thinking and doing, spirit and flesh. This prejudice is behind the myth that sports stars must be stupid, and philosophers or writers weak and anaemic. It is an outlook that sees physical and mental exertion as somehow in conflict. Not because there is too little time or energy, but because existence itself is seemingly split in two. There are ‘body’ people and ‘mind’ people; ‘flesh’ places and ‘spirit’ places – and to choose one is to forgo the other. This is what philosophers call ‘dualism’, and it can rob exercise of its lasting appeal. What attracted Nietzsche to the Greeks was partly their celebration of physicality. The perfect human being was not torn between frail flesh and eternal spirit. He or she was a living whole, whose mind and body worked happily together. ‘Can one go more dangerously wrong,’ he wrote in his notebook in 1888, ‘than by despising the body? As if that contempt did not condemn all intellectuality to sickliness’. The Greek outlook was summed up succinctly by the Athenian general, historian and memoirist Xenophon. As a young man, Xenophon was one of Socrates’ followers. In his memoirs, written in the fourth century before Christ, Xenophon recollected Socrates chastising a lazy companion, Epigenes – not just for his ideas, but for his sloth, and its corruption of character and thought. It is a base thing for a man to wax old in careless self-neglect before he has lifted up his eyes and seen what manner of man he was made to be, in the full perfection of bodily strength and beauty. But these glories are withheld from him who is guilty of self-neglect, for they are not wont to blaze forth unbidden. The point is this: exercise was not just a dull duty for the classical Greeks. Yes, citizen soldiers had to be fit, and no doubt many wearied of the daily oiling and grappling, grunting and lifting. But, from nobles like Xenophon to commoners like Socrates, the Greeks often saw exercise as a way to savour their full humanity. It was theirs, not Chad’s; not owned by a professional athlete or trainer. They kept sprinting, wrestling and throwing their javelins, not just because of war or health, but because it polished their souls, and they got a buzz out of it. Put more precisely, this is the Greek message: exercise offers virtues and pleasures, alongside hard bodies. → Damon Young is an Australian philosopher, author and commentator. He is an Honorary Fellow in Philosophy at the University of Melbourne and the author of many books including Philosophy in the Garden. He lives in Melbourne with his wife, son and daughter. This is an extract from Damon’s latest book, How To Think About Exercise one of the new titles in our ‘How to’ series, published with Pan Macmillan in January 2014. To buy the book click here.